Will taking the hand print or foot print impression hurt my child? Not at all. Most newborns don't like the process (just as they don't like nappy changes) as they find the clay to be an unusual texture and cold. However, the imprint process doesn't hurt and by the age of 12 weeks, most babies are too busy looking around and are not bothered at all. Is the clay safe for my child? Definitely. It’s a natural, non-toxic clay. What is the best age to get my baby’s footprint done? The younger the better! A young baby has many wrinkles in their feet which fade over time. Once a child starts walking most of the detail will be lost. What is the best age to get my baby’s handprint done? Young babies almost always have their tiny hands clenched but we can still get a beautiful handprint impression. It helps if your baby is well rested and has had a good feed so we can work with you to make an appointment time that's most convienent. Do you do the photography for the framed impressions with photos? No. We specialise in taking imprints of babies and children's hands and feet and we take pride in the artworks that we create. You provide the photo that you'd like to use in the finished artwork, either one that you've taken yourself or from a portrait session with the photographer of your choice. If you need a photographer, we can recommend some. Just get in contact via the Contact Us page. Yes we do. Simply give us a call or complete the details in the Contact Us page and we'll get back to you. Payment can be done using a credit card, bank transfer or Paypal and the gift certificate will then be sent to you. Online gift certificate purchase is coming soon. Which should I get done – my child’s handprints or footprints? It all depends on the age of the child and your preference. 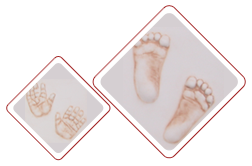 If you have a young baby, I would recommend footprint impressions as a young baby has many wrinkles in their feet which fade over time. Once a child starts walking most of the detail will be lost. If your child is older you may prefer to get one hand and one foot or why not get both handprints and footprints done. Yes. Appointments can be made for Tuesdays through to Saturdays. Can I call in anytime to do the impressions? No. Appointments must be made so that we can ensure that we're free to discuss your requirements and devote the time to you and your little one without interruption. Are you able to do a home or hospital visit to take the impressions? Of course. Call out fees apply (which will include any tolls and parking costs) and this must be paid before the appointment days. Send us an email or a text us on 0412 880827 for an accurate call out fee quote. Do I need to make an appointment to pick up my completed impressions? Yes. Appointments must be made so that we can ensure that we're here and not taking impressions of baby or dog at the time. We don't want you to be waiting around for us. My baby isn't in a routine yet so I'm not sure about an appointment time. Are you flexible with times? Having had children, we fully understand how difficult it can be to lock in a time especially with newborns. We can be flexible with the appointment time if we know about it, so just talk to us and we can work with you for a stress-free appointment. How long does it take to do the impressions? All going well, your appointment will take about 15 minutes for a double impression (2 hands or 2 feet or 1 hand & 1 foot) and about 20 minutes for both handprints and footprints. It can sometimes take longer to chose your frame and mat colours than it does to do the impressions.! You can pay both the deposit and balance using either cash, credit card - MasterCard and Visa are accepted - or you can use Paypal. A 50% deposit is required when the impressions are taken and the order placed. The balance is required at when collecting the finished piece/s or prior to delivery. Our home studio is located in the Sydney suburb of Seven Hills. There's plenty of parking either in the driveway or on the street. I live in Melbourne/Brisbane/Adelaide/Perth/outside Sydney. What can I do to get impressions of my child's hands and feet? Many of our clients have visited us while on holidays in Sydney. We can discuss your requirements, take the impressions and send the completed artwork to you. Alternatively, you could try Petite Prints where you can buy a DIY Impression Kit. They're not the same style but you'll be able to create something beautiful. When will I be able to collect my child’s impressions? The completed artwork of your child's handprints and/or footprints will be ready about 4 weeks after taking the impression. Are you able to take my angel baby’s hand prints and foot prints? Of course. We're able travel to the hospital or facility in the Sydney metropolitan area (call out fees apply). Your child will be treated with dignity and care to give you a precious memory.